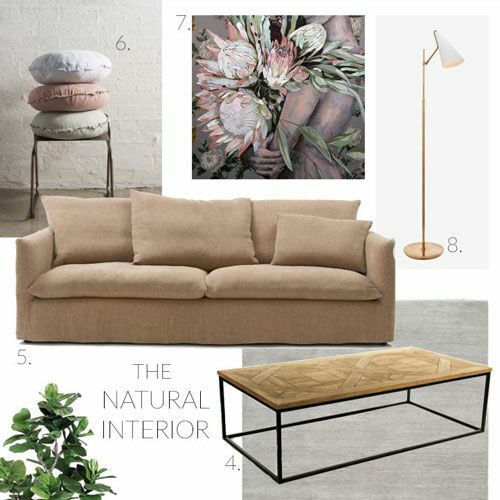 I’m in the process of sorting inspiration images for my latest Perth Kitchen design project and I thought why not share what trends I’m currently inspired by. 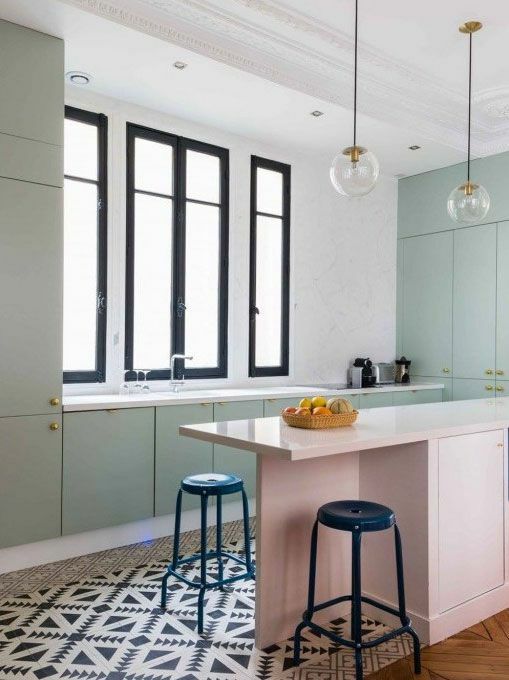 These Kitchens are based around the world but I believe this is where Perth Kitchen design is heading, carefully selecting colours that work together with a minimal base colour palette, then layering with timber tones (think thick timber shelves, or timber board accessories) and maybe a touch of brass or copper. Enjoy the post and remember to Pin your favourites to your dream kitchen Pinterest board! This recently-built house in Westchester County, NY, The brief was for a modern kitchen design with a casual welcoming vibe. 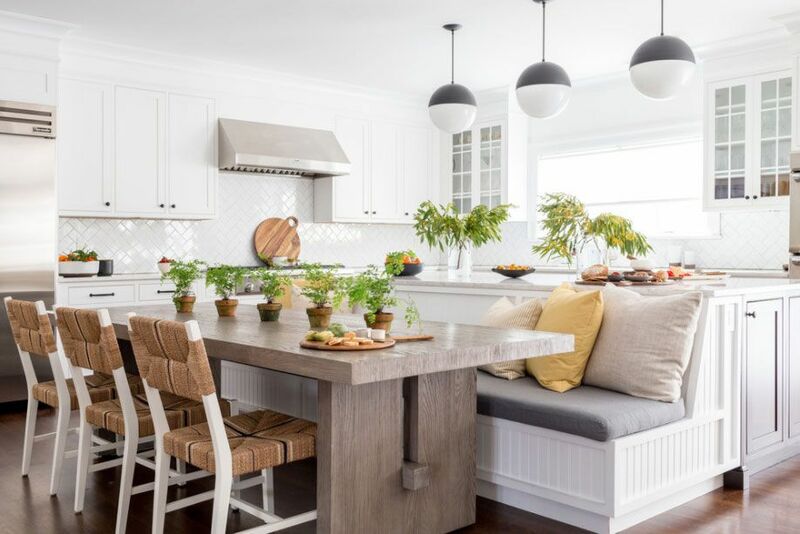 The modern Hampton Kitchen includes a white-bricked herringbone backsplash in the kitchen and a built-in dining bench for casual meals. All the light fixtures were replaced, the interior painted a crisp white, and window treatments added. 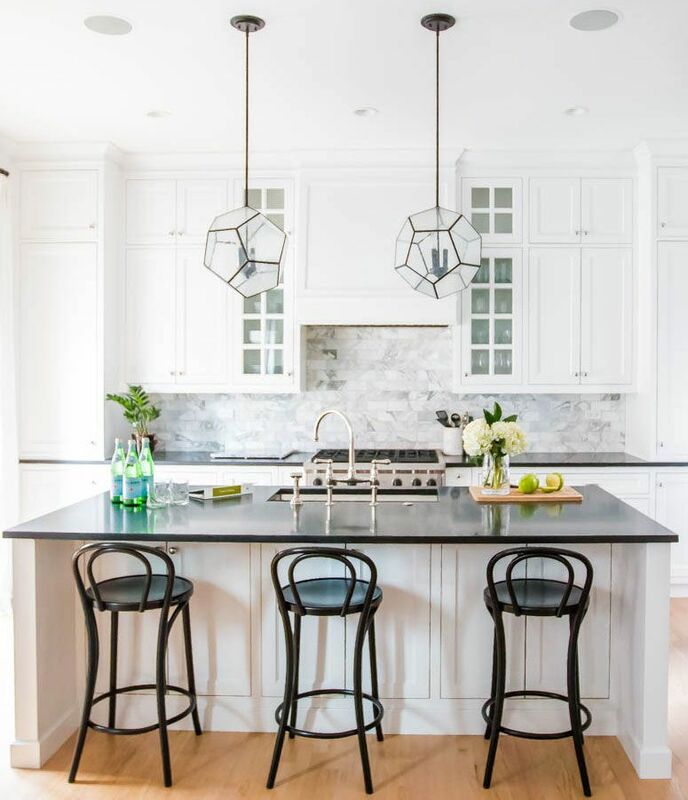 Chicago-based interior designer Alex Kaehler recently renovated her own home, “The biggest splurge was our kitchen, and yes it was definitely worth it. We invested in really fantastic appliances, used a custom carpenter to build our cabinets.” What I love about this kitchen is that it won’t date, it has that classic yet paired back style. 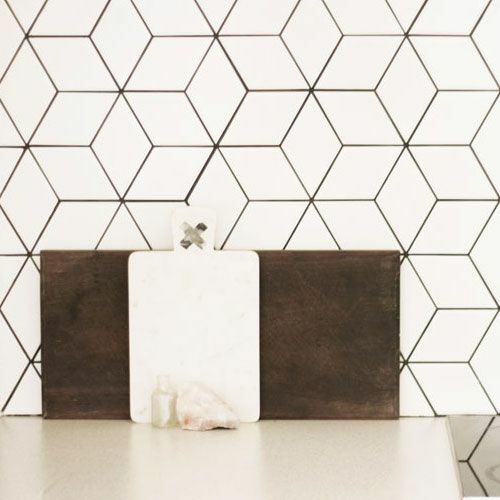 Using the marble subway tiles gives the space extra depth and a more luxury appearance. Situated in Sagaponack, a beachfront village in New York’s Hamptons The inspiration for this home was cozy, farmhouse chic. 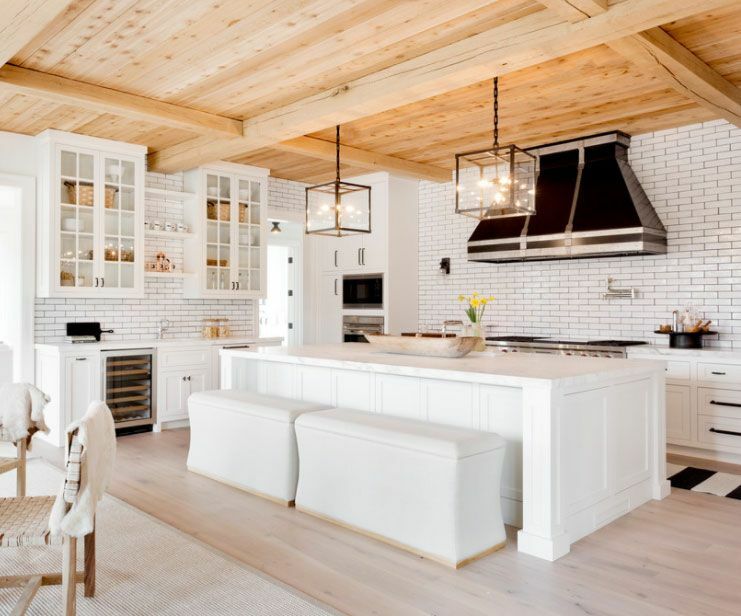 The feature of this Kitchen is the ceiling in the kitchen, a featured oak finish with beams, a common detail you’ll find in most European farmhouses. The crisp white cabinets and subway tiles and a large open plan kitchen are all elements that make this kitchen special. Also the hints of black from the custom range hood, pendant lights and handles tie in a classic cohesiveness. The Kerferd Road House by Clare Cousins Architecture team creates a contemporary scandi inspired kitchen. 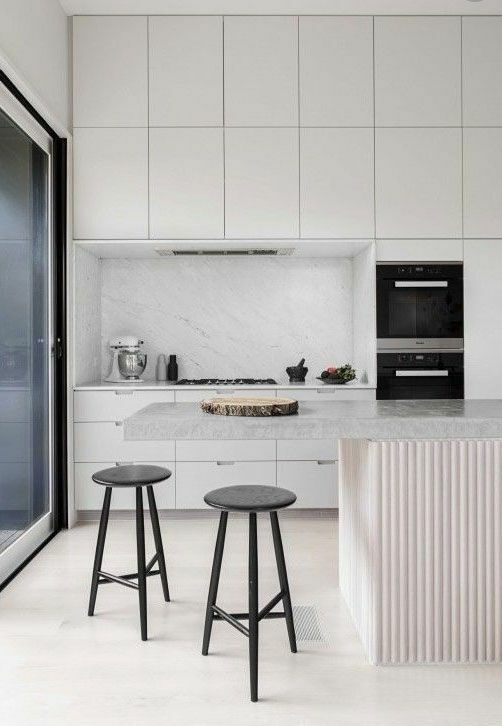 With a base white palette, marble splashback and stone bench top and whitewash timber tones give a minimal yet refreshed aesthetic. It’s great to see some colour in our Kitchens too! but I think some clients are scared the look may date, it’s all about selecting colours that you love and that uplift you the moment you enter the space. This pastel palette from Baldini Architecture is beautiful and paired back; the brass handles add a hint of luxe which coincides with the pendant brass fittings. Designed by: Biasol Design Studio Photography: Ari Hatzis. Melbourne Design Studio Biasol have converted a warehouse into a shared office space. It’s rustic warehouse style with hints of luxe via the gorgeous grey cabinets and stone backsplash work really well. The use of light timber from top cabinets and island bench; add warm tones to balance out the greys. Aushaus is the architect behind Concrete House. The beautiful rich materials, including purple-veined New York marble and brass detailing add a luxe feel to this kitchen. 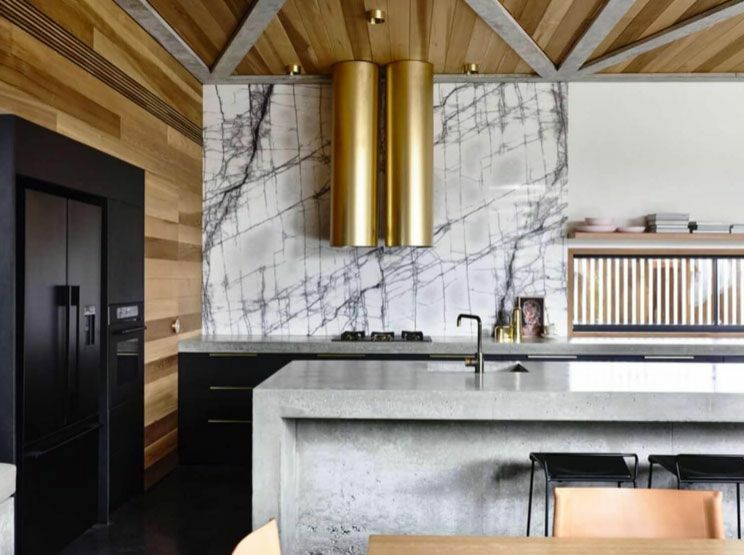 Incorporating the timber panelling ceiling envelopes the interior and adds a consistent theme throughout, but also balances the amount of concrete in the kitchen to create more drama and warmth. 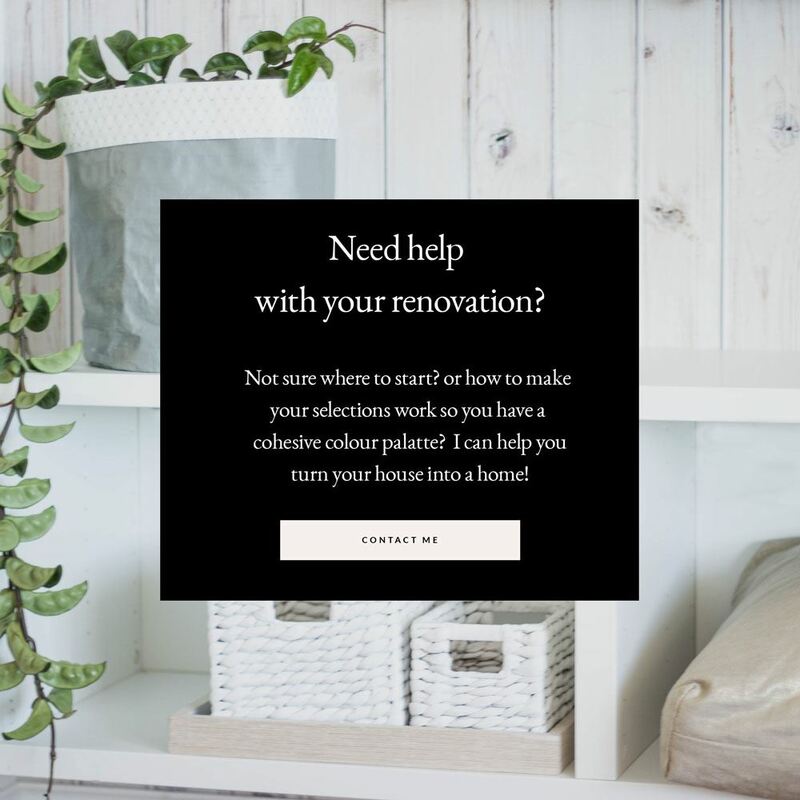 Studio McGee based in Salt Lake City in the US is one of my favourite design firms, creating relaxed, comfortable homes with hints of sophistication are what they do well. I love the amount of sunlight in this kitchen and the open plan layout. the black cabinets with brass fittings adds that hint of luxe whereas the solid timber open shelves give that natural raw element. Adding timber ones and greenery is so important to add a sense of nature and a grounding within the design. 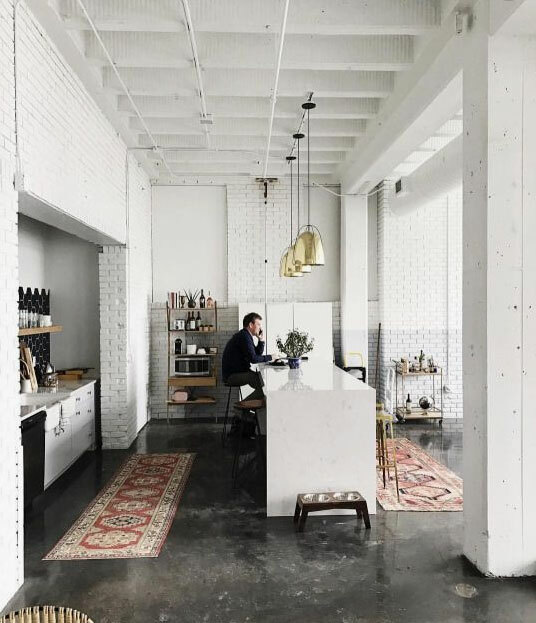 What I really like about this Kitchen is the fact they kept that warehouse feel without making everything glossy and new. 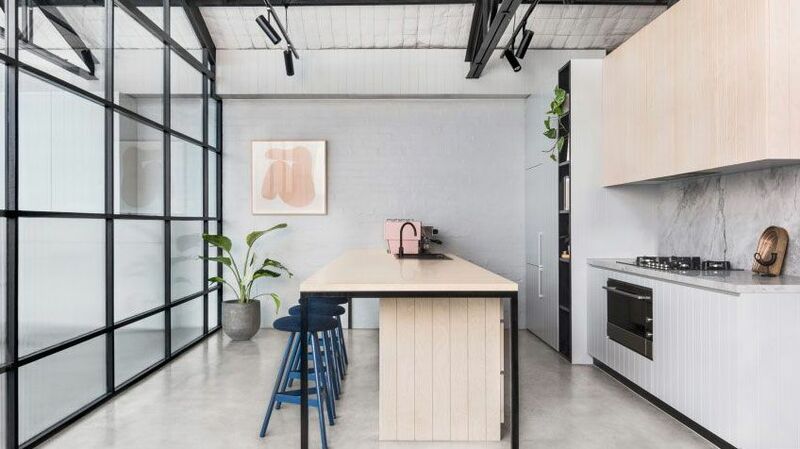 Keeping the ceiling open with exposed rafters, the painted brickwork all add to that warehouse tone. The gloss stone island bench and brass pendants create that contemporay feel and the beautiful turkish runners add colour but also zoning showing where traffic will flow. 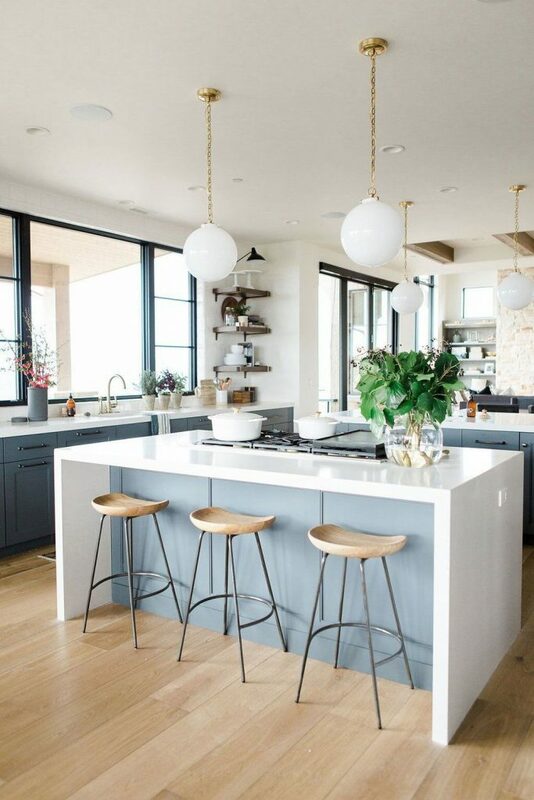 Another Kitchen from Studio McGee, I love the use of grey/blue tonal cabinetry. We need more colour in our kitchens, but they can still be contemporary that won’t date and this is a great example. The classic style pendant lights also add a touch of luxury and define the working zones of the kitchen. 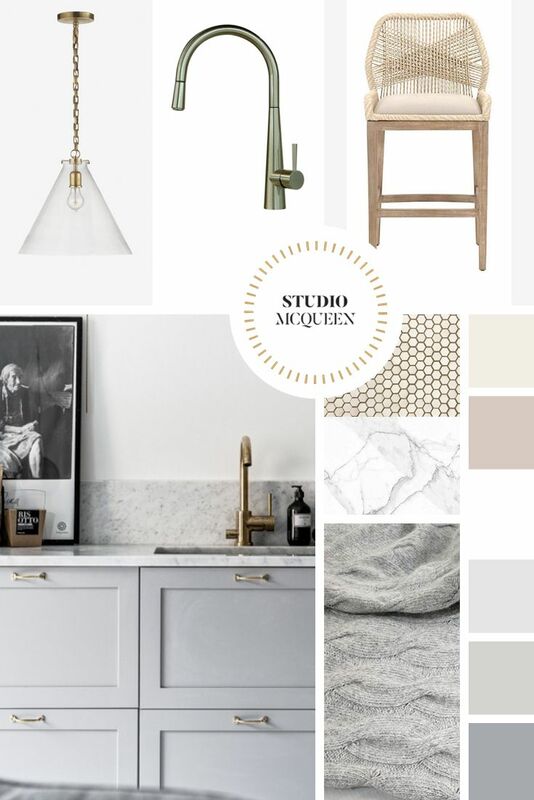 Using the inspiration from all the kitchens above I’ve designed my latest Perth kitchen design concept mood board showing finishes and materials. Lower cabinets in a mid-tone grey, white tonal quartz benchtop, brass handles to match in with pendants above. 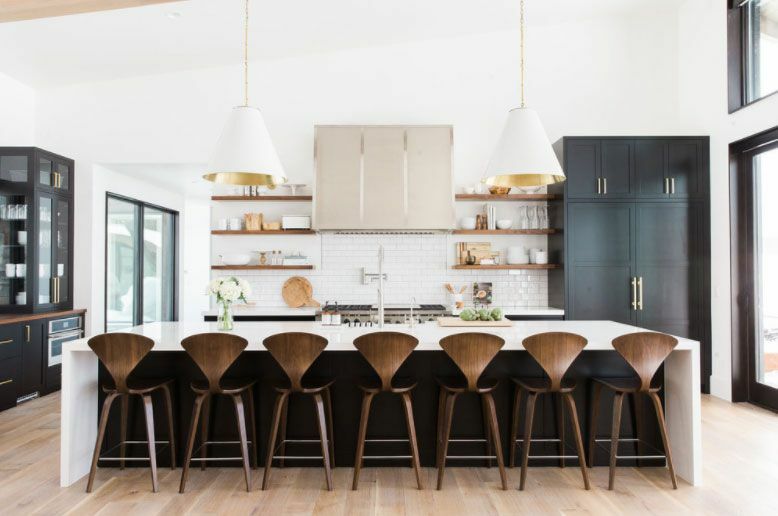 a hero piece the brass kitchen tapware and timber elements within the bench top stools and possibly a feature oak ceiling beam. 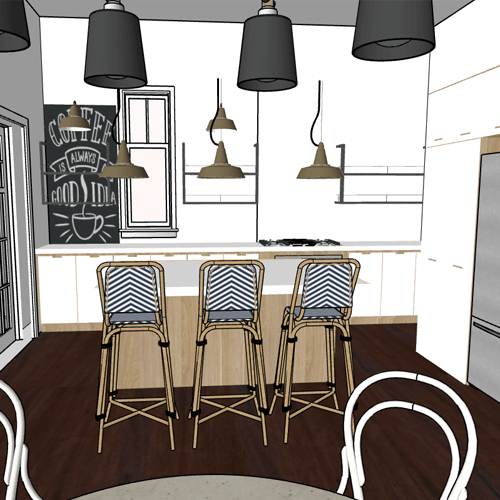 In a few weeks once finalised I’ll share the 3d Rendering to give you a better idea of the space. I hope you got some inspiration for your dream kitchen and pinned your favourites to your Kitchen Pinterest boards. Feel free to pop a comment in the comment box telling me which was your favourite Kitchen. 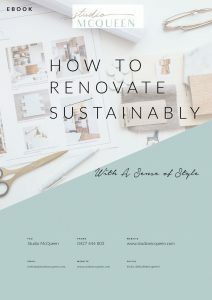 If you need help with renovating your kitchen or designing a new kitchen for your new home, have a look at my consultation packages where we could sort out the design layout and function of your kitchen, define the style of kitchen you love and what colours, finishes, fittings and lighting you’ll need to create your dream kitchen. 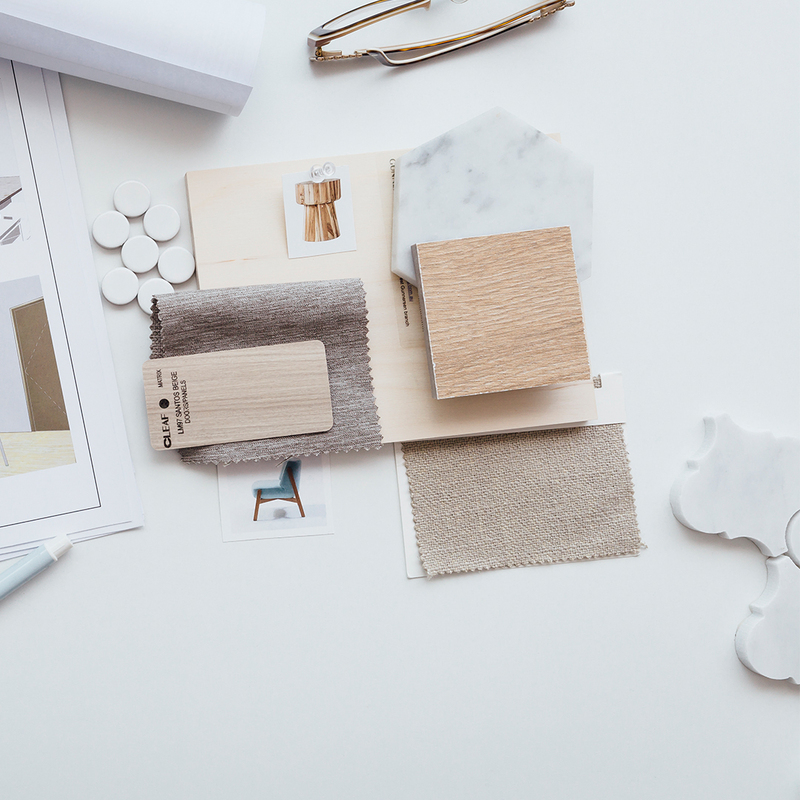 Are you ready to update your Perth Kitchen design and need a designer to create a functional + aesthetic dream kitchen? Interesting blog, best kitchen design have been provided. Was very useful, thanks for sharing the blog.